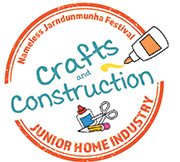 The aim of Crafts & Construction category is to encourage children’s interests and involve their creative thinking and design skills to construct items for themselves or give away. We would like to create an interest in the next generation around the planning and design process using the creative thinking process. Scarecrow and any props must be made from sustainable and recycled materials. Scarecrows must be free-standing, with a size not exceeding 1.5m in height, and 1m in width.